Tsukuba, Japan – Among the diversity of behaviors implemented by the brain, the prevention of actions that might be beneficial in a certain context, but counterproductive or harmful in another, is particularly important. Some insights into how the brain achieves this have been obtained, but much remains unclear, including the involvement of the neurotransmitter dopamine. Shedding light on this would explain much about how behavioral control is achieved, and could help treat diseases in which inhibition of certain actions is impaired. In a study involving analyses of gaze fixation and the visual tracking of targets in rhesus monkeys, researchers at University of Tsukuba have shown that the brain's dopamine system is key to the subsequent inhibition of actions that have already been planned. In this work, reported in the journal Neuron, the team placed two monkeys in front of a computer screen and, using the provision of rewards in the form of drinks, trained them to direct their gaze at targets on the screen presented in different patterns. The monkeys were trained to redirect their attention away from the center of the screen to another target in 70% of the trials, but to resist the temptation to do this in 30% of the trials when signaled to do so. At the same time as looking at the screen and undergoing visual scans using an infrared eye-tracking system, the neuronal activity of the monkeys was also measured, at single-neuron resolution. Specifically, the researchers recorded approximately 40 dopamine-related neurons in each of the monkeys, and analyzed the correlations between their activities and success or failure in resisting redirecting their gaze to a new target in the 30% of trials. "Using this experimental setup, we found that these dopaminergic neurons tended to be active when the monkeys successfully resisted the urge to redirect their gaze," Masayuki Matsumoto says. "We then confirmed that it was the dopaminergic system that caused this response inhibition by injecting drugs that block dopaminergic neurotransmission." 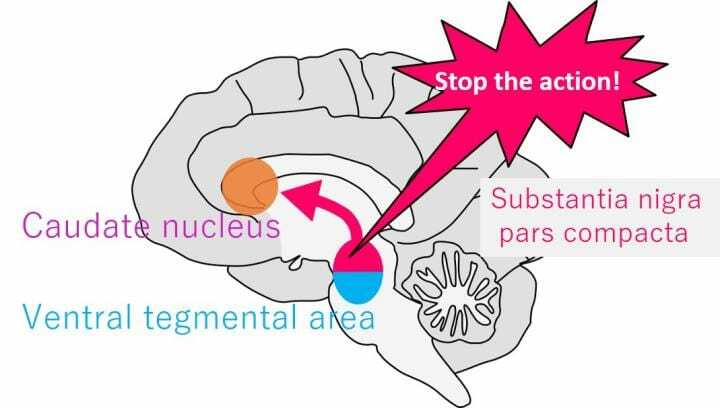 The team's findings reveal details about the specific brain regions and neurological pathways involved in this response inhibition, showing that dopaminergic neurons in the substantia nigra as well as striatal neurons are key to canceling a previously planned action. The duration of the pause between the initial command and the subsequent inhibitory counter-command also influenced the monkeys' success in the trials, providing hints about the mechanisms involved. "Now that we know more about how preplanned actions are inhibited in the brain, we may be able to develop treatments for conditions involving impaired inhibition, such as Parkinson's disease," says lead author Takaya Ogasawara.